Wallace Hall has been way more trouble than he is worth. 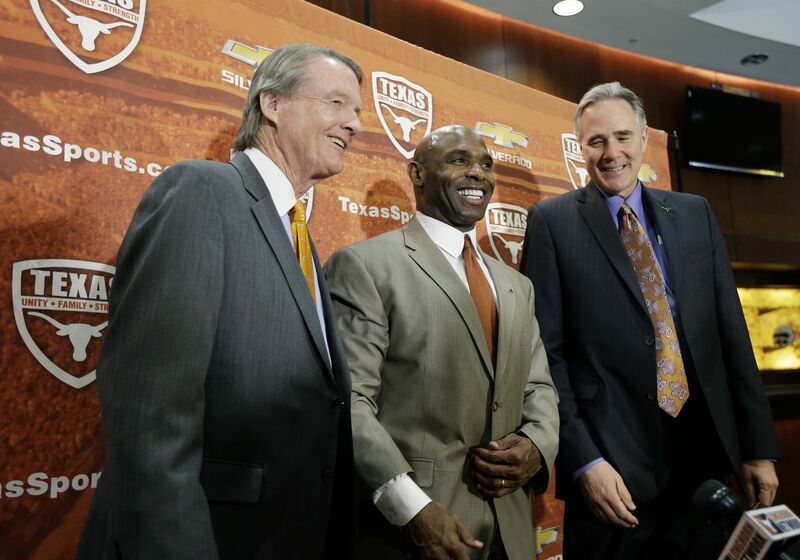 Whatever your political views, you’d have to be crazy to think Hall is a good thing for UT. Thank goodness we have Bill Powers to stand up to him. I think Mr. Hall has been demonized to a level he does not deserve. Not the brightest character on the Board of Regents, but not deserving of borderline abuse. Powers on the other hand deserves some additional criticism. His use of the press (Austin Statesman) to wage battles with the board of Regents was unprofessional and demonstrated poor judgement. That is one of the reasons Dr. Cigarroa had a problem with Powers, and I do not think the University community should brush aside so easily this point in their never ending praise of Lord Powers. There are two sides to most stories. Seriously? No data on how this ratio of fruit eating compares to other universities or even national grocery store averages? No data on how this historical ratio (or even quantity) has changed over time? This article is the most laughably useless, content-and-insight-free garbage I’ve read at the Texan yet. Well thank goodness for that. I don’t know what I’d do without Meyer and his hunch. Please tell me this was an April Fools joke and this nonsense is about to get replaced with a real article. If you don’t like it so much why don’t you move? Democrats whine and snarl all day that they don’t like the politics here, without realizing that they (and we) would be much happier if they’d all just get the heck out. Following UT politics is hard, but it’s often the most difficult things that are worth doing — or in this case, worth watching. Below is the Daily Texan editorial board’s guide to the issues to watch at UT during the spring 2014 semester, a list we will continue in Tuesday’s paper. And, if you have more of your own to add, tweet them at us with the hashtag #Texanwatchlist. On Dec. 12, after four and a half hours of closed-door discussion, the UT System Board of Regents refused to take action on the employment of President William Powers Jr., adding a new chapter to the nearly three-year-long battle between the president and the board. Given the personal turn the struggle has taken in recent years, with a state committee on transparency considering the impeachment of Regent Wallace Hall for overreaching his authority and the governor himself referring to those opposing the regents as “charlatans and peacocks,” the tense speech given by Chancellor Francisco Cigarroa, in which he accused Powers of misrepresenting the regents’ goals to those outside the situation, seemed about the best possible outcome. “In this context, understanding that I am hopeful that this strained relationship can be improved, it is my recommendation that Bill Powers should continue his appointment as president of the University of Texas at Austin,” Cigarroa said. Though Powers’ supporters were quick to declare a victory, there’s no indication that Powers will take Cigarroa’s advice to heart — or, for that matter, that Powers was any more guilty than the regents were of playing petty personal games at the expense of focusing on higher education policy. Granted, things are different this time around: Perry’s on his way out — though he might suggest he’s on to the presidency — meaning he can exert less influence through lasting appointments to the board. Powers, after years of fighting, may be just too damn tired to keep up the fight. And, with Mack Brown out, the insistent boosters rumored to be pressuring the regents to force Powers to oust his close friend or lose his own job are no longer an issue, if they were even one in the first place. But the fate of Regent Wallace Hall has yet to be decided, leaving a gaping hole in the narrative. Though the transparency committee weighing Hall’s fate has no future meetings scheduled, it has asked the UT System to reply to a series of directives on the regents’ history of open records requests by Feb. 1. But above all else, students should keep their eyes on this issue to see what happens if the powers that be stop lighting fires and allow the smoke to clear. When the fight between the regents and Powers started, the issues were educational in nature: how much to charge for tuition, how many students to put in a classroom, whether to fund online education expansion at the expense of on-campus initiatives. It’s only in the past year and a half that the struggle has devolved into arguments about the cost of open records requests and the influence politicians exert to get their children admitted to the University. Beyond the constant personal fights, the UT System is still struggling to balance raising its prestige with providing affordable education to an ever-increasing number of willing students. Those issues are worth fighting for, and it’s high time our regents and our president returned their attention to the proper battle. On Jan. 4, Charlie Strong accepted the position of UT’s head football coach, just under three weeks after Brown’s era ended when Brown stepped down from the position amid intense pressure from fans and pundits. But that money failed to lure Saban to the land of burnt orange, and after several other rumored candidates, including Baylor’s Art Briles, publicly declared their disinterest, Strong accepted. In a radio interview, McCombs called Strong’s hiring “a kick in the face.” McCombs has since apologized to Strong, but his statement is the clearest indication yet of the hurdles Strong may have to face to find success in his new position. Unlike his predecessor, Strong is in no way part of the good-old-boys booster network that has traditionally supported Texas football. And, as many members of the media have pointed out, Strong doesn’t even look like them: Unlike most men of influence in Texas, Strong is black, making him the first black football coach in Texas’ history. If the significance of Strong’s race is lost on any members of the UT community, they would do well to remember that the difference between black male representation on campus and black male representation on revenue-generating athletic teams at UT is 66 percent. And there are few black men enrolled at UT in the first place: only 842 as of 2011. Strong, of course, isn’t technically the first black head coach in Texas history. That title goes to Bev Kearney, the former women’s track coach. Kearney filed a $1 million lawsuit against UT in November after she was removed from her position for having a relationship with a student. The Kearney case, with its ever-unraveling layers of potential race and gender discrimination, may cast a cloud over the progress that is Strong’s hiring. Any student with an interest in equality should keep a close watch on both of Texas’ “first” black head coaches. When Mack Brown began his tenure in Austin 16 years ago he inherited a divided fan base. Now, after rejuvenating the Longhorns and getting Texas back to national prestige, he cited a similar situation as his reason for stepping down as head coach. A day after the school announced the Alamo Bowl would be his last game as head coach at Texas, Brown spoke to the media Sunday. Brown said he met with University President Bill Powers and new Athletic Director Steve Patterson Friday afternoon to discuss the future of Texas football. After deliberating many options with his wife, Sally, he came to the conclusion the best decision for the university was to step down. Brown’s announcement came at the end of an eventful week. On Tuesday, reports surfaced that Brown was retiring, sending Texas into a frenzy. After Brown and the university denied those reports, many believed the veteran head coach would announce his resignation at the Longhorn banquet Friday night. Instead, Brown made no mention of his future until his official decision came Saturday night. While Brown has struggled in recent years, he set the standards Texas lives up to today. After 16 years in Austin, Brown said it’s pretty simple how he wants to be remembered for his tenure at Texas. Brown said he will have no involvement in the search to find his replacement. He will spend the next two weeks preparing for Oregon and will then become a special assistant to President Powers. Patterson and Powers, who spoke after Brown, discussed the search for Texas’ new head coach and admitted they have yet to spend much time recruiting. But they did debunk any rumors surrounding Alabama head coach Nick Saban. Patterson also said there is no timetable for when Texas will to hire its new head coach. But he did say the sooner would be better. A day after football head coach Mack Brown stepped down as the head coach at Texas, Brown, President William Powers Jr. and men's head athletic director Steve Patterson reflected on his 16-year tenure while also looking forward. Patterson and Powers will soon embark on a thorough coaching search, seeking a coach who fits the Longhorns’ criteria and can advance the foundation Brown laid in Austin. Brown will move into a consultant’s role under Powers, where he will assist the university in an undetermined fashion. The 62-year-old former head coach made it clear he would not be a part of the hiring process for Texas' next coach. Brown said he would only provide his input if Powers or Patterson asked. Patterson said he had not spoken to anybody about replacing Brown yet. But he listed of a number of factors he considered paramount in the Longhorns’ next head man. He wants a coach with the ability to handle scrutiny, recruit at the highest level and manage graduation rates. But most importantly, Patterson emphasized the necessity of winning. “The key is setting the criteria, getting some clarity around that,” Patterson said. The first-year AD also made it clear any coach he would hire needs college football coaching experience. Powers spent much of the press conference complimenting Brown’s integrity, and stressed the necessity of this attribute for Texas’ next head coach. Patterson did not put a timetable on the coaching search. Patterson said he had not thought about who the next coach could be, and he would take his time with the process. He also stated the university had not decided whether it would hire a search committee to assist with the procedure. Patterson also stressed the need to keep the hiring process quiet and out of the media. Powers insisted that it would be Patterson, not he or Texas’ board of regents, making the hiring decision. Powers also insisted the regents did not play a part in Brown stepping down, nor will they help decide the Longhorns’ next coaching hire. Update at 4:50 p.m.: The UT System Board of Regents opted to take no action regarding President William Powers Jr.'s employment situation Thursday afternoon, though UT System Chancellor Francisco Cigarroa issued a strong warning to Powers to "improve relationships" with the UT System and the board. After being in executive session for nearly four-and-a-half hours, Cigarroa made a lengthy statement to the board in which he alternated between criticizing and praising Powers. Cigarroa said Powers had made public statements that showed misalignment between UT and the System despite being in agreement, and that Powers had been at times difficult to work with. Cigarroa also acknowledged Powers' broad support among faculty, students and alumni, and that a change in leadership would make it difficult for recruitment. He said the relationship between himself and Powers has also improved recently. Cigarroa then recommended keeping Powers as the president of UT, and board Chairman Paul Foster adjourned the meeting. 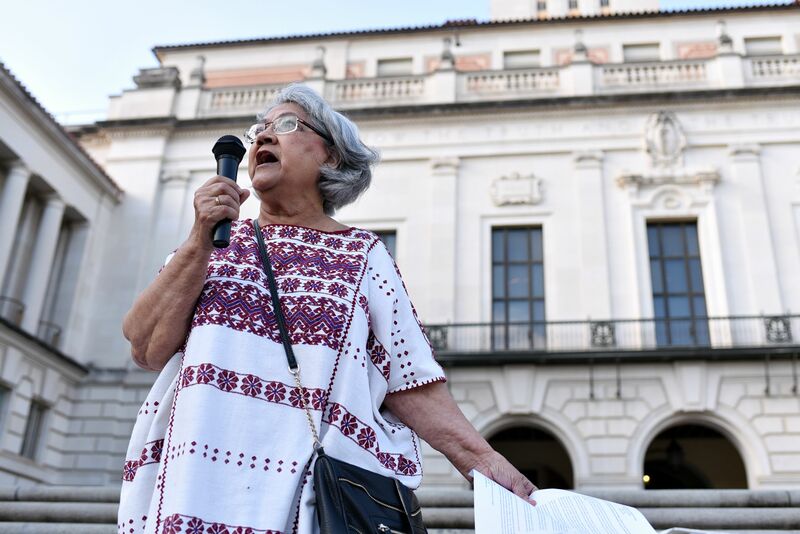 "I'm optimistic about the future of UT-Austin, and I'm confident all this controversy will soon be a distant memory," Foster said. After the decision, Powers said he is thankful for the chancellor's support. 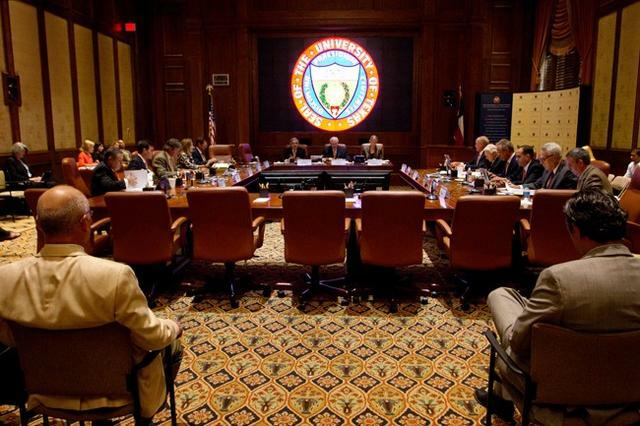 Update at 4:35 p.m.: UT System Board of Regents take no action regarding Powers. Update at 4:31 p.m.: UT System Chancellor Francisco Cigarroa: "I am hopeful that the strained relationship [between Powers and the UT System] can be improved... it is my recommendation that Bill Powers remains president of the University of Texas at Austin." Update at 4:15 p.m.: The UT System Board of Regents have just ended executive session are allowing media and outside personnel to convene in the conference room. Update at 11:15 a.m.: Brown said he would not speak on his employment situation during the press conference, saying he needed to speak with President William Powers Jr. and new men's head athletic director Steve Patterson before doing so. Brown also apologized to Valero Alamo Bowl officials for his job status serving as a "distraction." Brown avoided questions about his future during the press conference, making a brief statement and then asking the media to refrain from asking questions unless they were about the Alamo Bowl. Afterwards, university benafactor Red McCombs spoke to the media and had this to say about Brown's situation. "I think that Mack has earned the right to choose whatever he wants to do, whether he wants to stay or he wants to go," McCombs said.... "If you can find a reason to get rid of a guy like that, you’d really have to reach." He also had the quote of the day when he spoke about Texas' potential interest in Alabama head coach Nick Saban and if Texas had enough money to sway him to Austin. "I don't think there's any question," McCombs said. "All the money that's not in the Vatican is up at UT." Original: On the second day of final exams, two of the University’s most prominent faces will be sizing up to tests of their own. The UT System Board of Regents plans to hold a discussion “concerning [the] employment” of President William Powers Jr. at its meeting today, according to the board’s agenda. Meanwhile, about 80 miles south in San Antonio, football head coach Mack Brown faces questions from reporters about his job situation for the first time since reports of him stepping down emerged earlier this week. The University strongly denied those reports. Brown is in San Antonio for a coaches availability for the Valero Alamo Bowl, in which the Longhorns will face of with the Oregon Ducks on Dec. 30. The tenuous employment situations of the pair of friends and hexagenarians have been ongoing since 2010. Powers and a handful of the regents have disagreed over a range of topics including the purpose of higher education, tuition increases and fundraising. Currently, the Texas Legislature is holding impeachment hearings on whether Regent Wallace Hall overstepped his duties as a regent, with allegations that he was leading a “witch hunt” to oust Powers. And Brown, after leading the Longhorns to nine straight seasons of 10 wins or more and a national championship, has struggled to get Texas back on track after a disastrous 5-7 season in 2010. Powers and Brown are also being evaluated by a different pair of eyes than they had in the past. Gov. Rick Perry appointed two new regents — Jeffrey Hildebrand and Ernest Aliseda — to the board in February, while the University hired Steve Patterson last month to replace long-time men’s head athletic director DeLoss Dodds, who will be retiring in August. Check in with The Daily Texan for updates on Brown and Powers through the day. University of Texas President Bill Powers shot down any rumors of Alabama head coach Nick Saban becoming the Longhorns’ new football Thursday, according to the Austin American-Statesman. Powers also said no decision had been made about current head coach Mack Brown’s future with the team. "I've never met Nick Saban,” Powers told the Statesman. “I've never talked to Nick Saban. We have not hired Nick Saban. Mack’s our coach, and I can say flatly that the rumors we have hired or come to an agreement with Nick Saban or even talked to him are false." Saban has been the head coach at Alabama since 2007, winning three national championships in the last four years. Despite his success, rumors have circulated throughout the season that Saban would consider leaving Tuscaloosa to coach the Longhorns. Brown continues to maintain interest in continuing his career at Texas until his contract runs out in 2020. He has coached the Longhorns since 1998, winning the national championship in 2005 and reaching the title game in 2009.